Domino Toppling - Set 'em up & knock 'em down. Some truly amazing feats have been accomplished in the world of domino toppling, with millions of dominoes - representing months or even years of work in design, preparation, & setup - are toppled in just a few minutes. 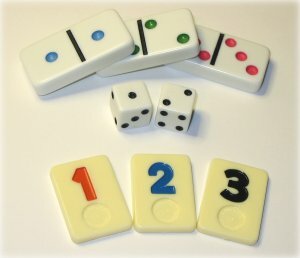 Domino Puzzles - Since dominoes are mathematically structured - each domino having two numbers, each number ranging from 0-6 (or more) - they are naturally suited to being used in puzzles, brainteaser, and mind games. Domino Divination - Some people believe that dominoes can be used to tell the future. Dice Games - Dominoes are a descendent of dice, and dice can be played in any number of interesting and challenging games, including Bunco, Shut-The-Box, Yahtzee, and many more. MahJongg Games - Chinese MahJongg tiles share many characteristics with dominoes, both of them being made up of tiles with symbols, that lend themselves to many different games. Rummikub - Another tile-based game, this one using tiles that correspond to a deck of cards. As the name suggests, the most common game played with these tiles is a rummy-like game. Domino Art - Artwork created with and/or inspired by dominoes. Also, jewelry made of dominoes.